This resume sample shows you how you can reengineer your resume to apply for entry-level engineering project management jobs. As you search for one of your first project management positions, you need to prove that you have the potential to lead engineering projects to successful conclusions, says resume expert Kim Isaacs. This resume sample that she created below shows how you can reengineer your resume to apply for entry-level engineering project management jobs. 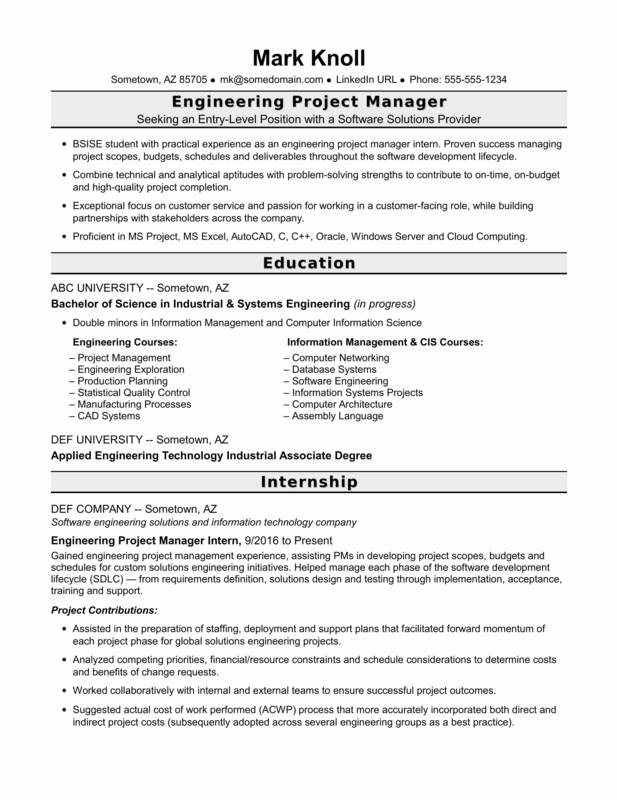 You can also download the entry-level engineering project manager resume template in Word. And if you need more help, get a free resume evaluation from the experts at Monster's Resume Writing Service. Engineering jobs are projected to grow 7% (or 194,300 jobs) from 2016 through 2026, according to the Bureau of Labor Statistics (BLS). Working in engineering, you can expect to make a median annual salary of $76,180. Learn more about project management careers and engineering careers, and search for engineering project manager jobs on Monster. BSISE graduate with CAPM certification and experience as an engineering project manager intern. Proven success in managing project scopes, budgets, schedules and deliverables throughout all phases of the software development lifecycle. Combine technical and analytical aptitudes with problem-solving strengths to drive projects to on-time, on-budget and high-quality completion. Exceptional focus on customer service and passion for working in a customer-facing role, while building partnerships with stakeholders across the company. Proficient in MS Project, MS Excel, AutoCAD, C, C++, Oracle and Windows Server. Gained engineering project management experience, assisting PMs in developing project scopes, budgets and schedules for custom solutions engineering initiatives. Helped manage each phase of the software development lifecycle (SDLC) — from requirements definition, solutions design and testing through implementation, acceptance, training and support. Assisted in the preparation of staffing, deployment and support plans as well as checkpoint reviews that facilitated forward momentum of each project phase for global solutions engineering projects. Analyzed competing priorities, financial/resource constraints and schedule considerations to determine costs and benefits of change requests. Worked collaboratively with internal and external teams to ensure successful project outcomes. Suggested actual cost of work performed (ACWP) process that more accurately incorporated both direct and indirect project costs (subsequently adopted across several engineering groups as a best practice).